Norman Leslie Smith was an Australian professional racing driver. 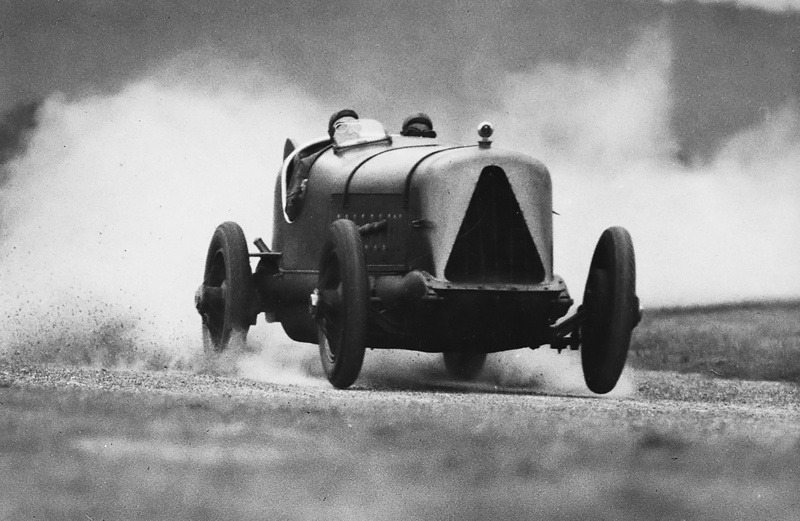 In the 1920s, he began to dominate hill climb, endurance, and point-to-point speed events. The nickname “Wizard” was bestowed upon him in December 1922 after his uncanny abilities behind the wheel were demonstrated while he won a 1,000-mile (1,609-km) Alpine rally in Melbourne. Earle Croysdill was Smith’s riding mechanic, and more than 50 racers had entered the event. Smith drove his racer from his home in Sydney, completed the race, and then drove the 560 miles (900 km) back to Sydney. The nearly-finished Anzac LSR car sits outside of the Harkness & Hillier Engineering Works in Five Dock. The car is missing its windscreen, seats, and gold paint. An additional louver was added under each exhaust stack, and the Australian flag painted on the tail would later be moved higher with “Advance Australia” written under it. Don Harkness is on the extreme right; he is looking at Norman “Wizard” Smith, who is holding one of the two black shop cats that, for a time, made the Anzac their home. During 13 and 14 March 1928, Smith captured the Australian records for distances covered in 6, 12, and 24 hours while driving a Studebaker Commander that was stock, with the exception of an additional fuel tank. The respective distances and speeds traveled for the records were 455 miles at 75.8 mph (732 km at 122.0 km/h), 857 miles at 71.4 mph (1,379 km at 114.9 km/h), and 1,701 miles at 70.9 mph (2,737 km at 114.1 km/h). Not quite done, Smith, with Ted Poole and Len Emerson, drove from the western coastal town of Fremantle (near Perth) to the eastern coastal town of Brisbane by way of Adelaide, Melbourne, and Sydney. Their 6-day, 5-hour, and 22-minute journey spanned from 31 March to 6 April and covered some 3,700 miles (5,955 km), including backtracking. The trip set new point-to-point records between all of the major Australian cities they visited. In late 1928, Smith happened upon Jack Mostyn, former Mayor of Sydney, who was fixing a flat tire. 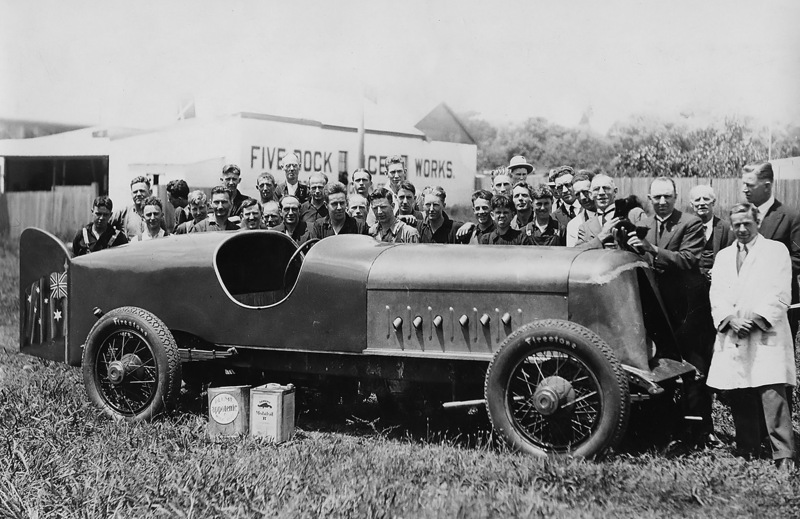 It was during this impromptu roadside meeting that the idea of creating an Australian Land Speed Record (LSR) car was born. At the time, the speed record stood at 207.552 mph, set by Ray Keech in the White Triplex Special on 22 April 1928. Smith and Mostyn did not intend to go directly after this record. First, they would build a car that could achieve around 175 mph. This car would be capable of setting Australian speed records and records over longer distances. If everything went well, a second LSR car would be built with a top speed of 250 mph in mind. But to achieve such lofty goals, the men needed an engineer to design and construct the cars. Finished, the Anzac is taken on a test run by Smith and Harkness. The name “the Anzac” was not painted on the car until later. It is not clear when the name was assigned to the car. Note that both front tires are essentially off the ground. Smith and Mostyn turned to Donald James Harkness, a well-known race driver and engineer. Being around the same age, from the same area, and competing in the same events, Smith and Harkness had known each other for some time. Harkness agreed to partner with Smith and Mostyn to design and build the LSR cars for just the cost of their parts. The first car was the Anzac, named as a tribute to the Australian and New Zealand Army Corps, which had fought in World War I. Smith had joined to fight in World War I, but rheumatic fever ended his service and returned him to Australia. The Anzac was designed by Harkness and built at the Harkness & Hillier Engineering Works in Five Dock, near Sydney. The car was of a conventional layout and about 20 ft (6.1 m) long with an 11 ft (3.4 m) wheel base and a 4 ft 8 in (1.4 m) track. The Anzac was built on a heavily modified and strengthened Cadillac frame and powered by a 360 hp (268 kW) Rolls-Royce Eagle IX V-12 engine. The Eagle IX was the latest and last of the Eagle line, the first of which was designed in 1915. Purchased as surplus from the Royal Australian Air Force, it was the most powerful engine Smith and Harkness could acquire. The three-speed transmission, originally from the Cadillac, and drivetrain of the Anzac had been configured for an engine with a clockwise rotating crankshaft. As installed in the Anzac, the engine’s crankshaft rotated counterclockwise. A special transfer case was built and installed to take the counterclockwise input from the engine and convert it to a clockwise output for the drivetrain. The transfer case added weight and complexity and consumed some engine power. However, the transfer case had a 2:1 overdrive gearing. Modifications to the engine enabled 2,800–3,000 rpm, which gave the Anzac a theoretical top speed of 175–188 mph (282–303 km/h). Smith looks on as Harkness pours oil into the Anzac’s tank during this publicity shot. Note the Vacuum Oil Company’s Mobiloil BB (SAE 50) oil can with the gargoyle logo. The Vacuum Oil Company was one of the few sponsors of the Anzac. When Vacuum merged with the Standard Oil Company of New York (Socony) in 1931, the “Mobil” name was retained for the oil, but Socony’s red Pegasus was used as the logo. Efforts were made to keep the Anzac relatively clean aerodynamically, but it was not very streamlined. The Eagle’s individual exhaust stacks protruded from the engine’s cowling, and a radiator cap with a temperature gauge sat proud at the front of the car. A large triangular opening at the front of the car brought in air to the radiator, and the air exited from louvers cut into the sides of the engine cowling. The cockpit accommodated a driver and a riding mechanic. A small windscreen protected the driver, but the riding mechanic was exposed to the slipstream. The fuel tank was positioned behind the cockpit, and an oil tank was located behind the rear axle. The car’s body tapered behind the cockpit, and a stabilizing tail was attached to its extreme rear. The Anzac was funded primarily by Smith, with few sponsors. When it was finished, the car was painted gold with an Australian flag on its tail. When the Anzac was completed at the end of 1929, the LSR stood at 231.362 mph (372.341 km/h), set by Henry Segrave in the 930 hp (694 kW) Irving-Napier Golden Arrow on 11 March 1929. A number of other record contenders were preparing cars, including Kaye Don in the “4,000 hp” Sunbeam Silver Bullet and Donald Campbell, who was reworking his Blue Bird from 900 hp (671 kW) to 1,450 hp (1,081 kW)—both Don and Campbell were eyeing 250 mph (402 km/h). Smith and Harkness knew the 360 hp (268 kW) Anzac was at best capable of 175 mph (282 km/h) and would not be able to compete with the LSR monsters. The absolute LSR was far out of reach, but the Anzac was capable of setting local speed records and of setting records over longer distances. The Anzac also served to gain LSR experience that would be applied to the construction of a faster car. Smith and Harkness, both on the far left, pose with others and the Anzac on Ninety Mile Beach. Note the louvers added under the exhaust stacks. The Firestone Tire and Rubber Company provided the tires for the record runs. Smith had spent some time searching for a suitable location to run the Anzac and had found Ninety Mile Beach, which is actually 55 miles (88 km) long. Ninety Mile Beach is situated just north of Kaitaia, at the north end of New Zealand. Apparently, Smith did not investigate Lake Eyre or Lake Gairdner, both in Australia and both the future sites of many speed runs. 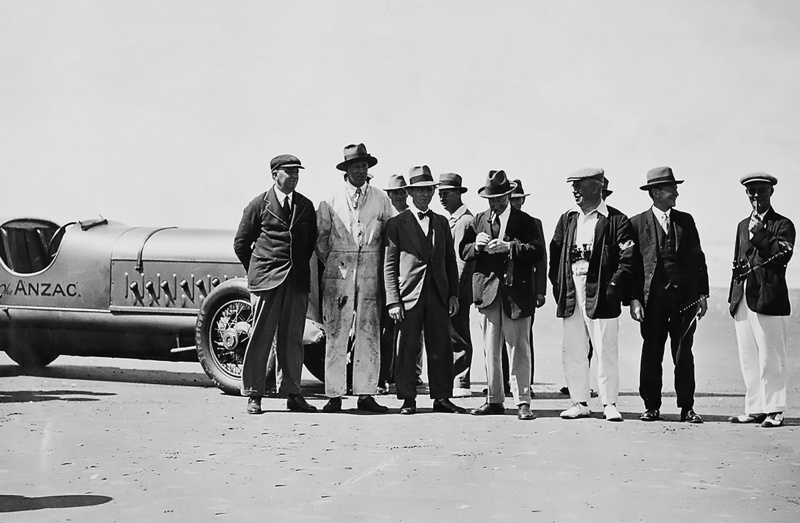 Before shipping the car off to New Zealand, test runs were conducted on Seven Mile Beach near Gerringong, about 80 miles (130 km) south of Sydney. The Eagle engine was started and warmed up using a set of “soft” spark plugs, which ran hotter to burn off deposits but were prone to heat damage. Once at temperature, the engine was shut down, and the 24 “soft” plugs were replaced with “hard” plugs, which ran cooler and better withstood the high temperatures inside the engine at power. On 1 December 1929, Smith, Harkness (as a riding mechanic), and the Anzac set a new Australian absolute speed record at 128.571 mph (206.915 km/h). The previous record stood at 107.14 mph (172.43 km/h) and was set by Harkness on 17 October 1925. 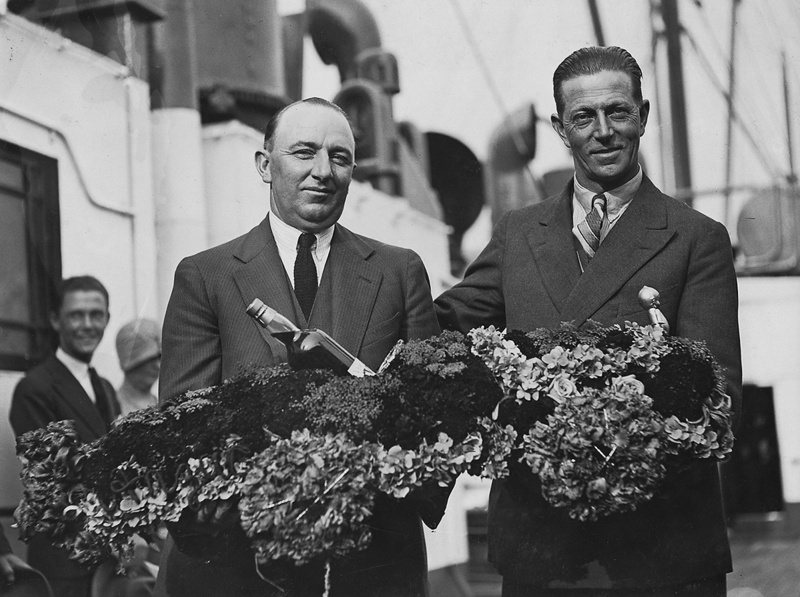 Smith and the Anzac had arrived in Auckland, New Zealand by 31 December 1929 and made their way to Kaitaia. On his previous visit, Smith had arranged with Fred Mitchell, owner of Star Garage in Kaitaia, to use the garage as his base of operations. In addition, the garage’s chief mechanic, Charlie Bowman, would assist Smith with maintaining the Anzac. With the car ready and the weather acceptable, Smith drove the Anzac around on public roads for a little extra publicity before the record attempts. While the large and loud Anzac certainly turned heads, this escapade also damaged the clutch. Repairs were subsequently completed at Star Garage, but the job was made much more difficult because of the added transfer case. Rather than fix the clutch and risk it failing again, the transmission was coupled directly to the transfer case. From then on, the Anzac was started and stopped in gear, and Smith shifted without the aid of a clutch. The Anzac in its final form makes a test run on Ninety Mile Beach in New Zealand. The filler cap for the fuel tank can be seen on the rear of the car. A storm had made Ninety Mile Beach temporarily unsuitable for any record attempts, but the tides quickly repaired the damage and returned the beach to a near-perfect condition. However, sharp toheroa shells littered the beach and cut into tires. 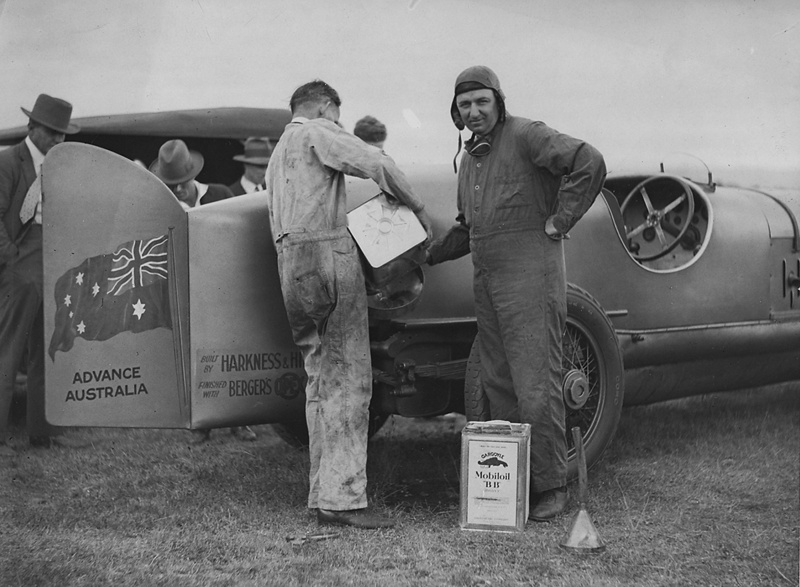 On 11 January 1930, Smith and Harkness pushed the Anzac and established a New Zealand flying mile (1.6 km) speed record. The southeast run was completed in 24.6 seconds for an average speed of 146.341 mph (235.513 km/h)—this speed is often mistakenly reported for the event. Rain slowed the northwest run, which was completed in 25.4 seconds at an average of 141.732 mph (228.096 km/h). The average of the two runs was 144.037 mph (231.805 km/h). Six days later on 17 January 1930, Smith and Harkness made an attempt on the 10-mile (16-km) World LSR, then held by Leon Duray* at 135.333 mph (217.798 km/h). 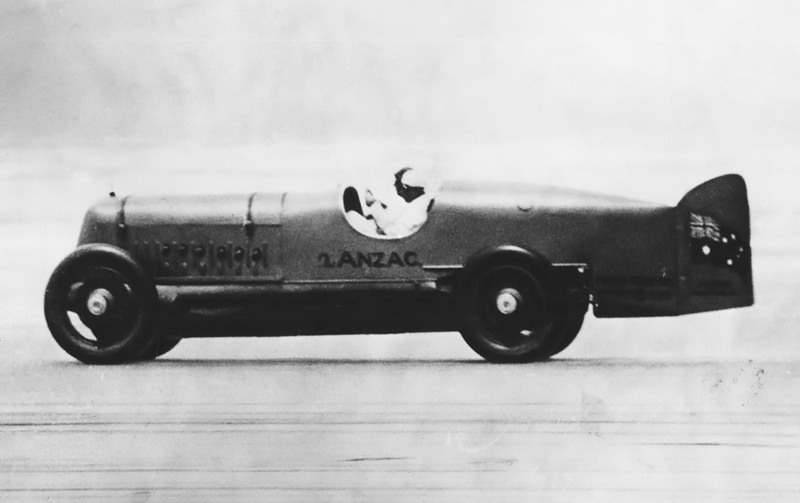 The Anzac averaged 148.637 mph (239.208 km/h) on the southeast run, which took 242.2 seconds. Smith was told that because of the distance, no return run would be necessary and that a new 10-mile (16-km) world speed record had been established, breaking the existing record by over 13 mph (21 km/h). Despite the Anzac’s impressive performance, Smith and Harkness learned in April 1930 that their 10-mile (16-km) record was not officially recognized because of the one run and the outdated equipment used to time the event. Perhaps there was some disappointment, but before even leaving for New Zealand, Smith and Harkness had begun design work on the second car, a true LSR monster with a 300-mph (483-km/h) top speed intended to bring the absolute speed record Down Under. That LSR car would become the 1,450 hp (1,081 kW) Fred H. Stewart Enterprise. Smith had planned to use the Anzac for future record attempts, but preoccupation with the Fred H. Stewart Enterprise took all of Smith’s time, and the Anzac made no further record runs. *Some sources state the then-current 10-mile speed record exceeded by Smith was held by Céasar Marchand (France) at 133.540 mph (214.912 km/h) and set on 12 January 1928. However, records indicate Leon Duray (USA) broke this record on 10 August 1929. Full of hope, Smith and Harkness celebrate as they sail from Australia to New Zealand. The men hold a floral model of the car with “Anzac” written behind the rear wheel. This entry was posted in Automotive and tagged Land Speed Record on 20 September 2018 by William Pearce.